Doesnt feel like summer today. Low 20's with single digit DP's. Feels really refreshing for a change, i like it. This morning's minimum of 2.8 C ends a run of 46 consecutive nights here in Berridale where the temperature never fell below 10 C. My 9-year average minimum in January is 12 C.
Today's the equivalent of the warm spring day. How wonderful but I want the humidity back soon for some storms lol. Drove through parra earlier. Lots of toppled branches even trees were snapped. SES were still working hard to break down the tree/branches hats off to them. Bloody SSW breeze halted my temperature from plummeting any lower than 2.6° C; likely much calmer down Berridale-way due to lying leeward of these Westerlies—unlike up here. Here are a few images from yesterday storms. 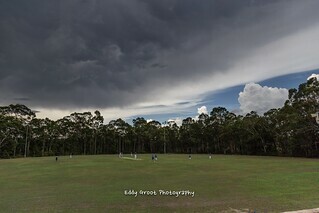 At Karuah oval the view isn't all that great, first storm approaching from a North-West direction, just some heavy drops. Still the first storm, looking in a North-East direction. Under the anvil with some development to the east. Probably not even fifteen minutes later we were hit with that storm that was detailed warned for the Bay, this storm was also the same storm that went through Clarence Town a little earlier. It hit hard for all of 30 seconds with complete white out conditions, in the end the storm was lucky to have last 5 minutes and according to a local PWS 10.7mm fell. The backend of the storm on its way to the bay. A hail shaft can be clearly seen here. 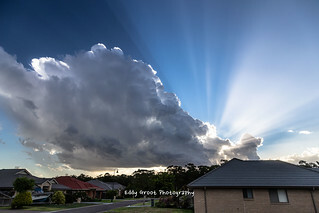 Returned home to witness some nice crepuscular rays, not 15 minutes later this was a rumbling little storm. All in all not a bad day, even if a cricket match ended in a draw. I wish all post-southerly days were like today instead of the usual overcast gloom we normally get. As per everyone's obervations, today feels like a crisp autumn or early spring day. From the forecast, the nights seems to be getting much crispier now, it feels like autumn in on the way. What are everyone's thoughts about Tuesday? A possible 40 in the basin? As much as I am looking forward to the return of the heat and humidity, today wasn't all that bad for a southerly. The clear clean skies is what I enjoyed the most. Winds are already starting to swing Nor-east, although very light, humidity and dew point slowly creeping up. Wouldn't be surprised to see the west hit 40c. Time will tell. Good storm cloud photos Eddy - I especially liked the sunset. It was a beautiful day today. I echo the sentiments about Post-Southerly days. The difference today is, it was a deep infusion of Southern Maritime air across the state, not just a shallow SE stream of cool dank Tasman air inserted under hot air aloft, so no marine layer cloud. Actually, for OH, today was average: 65-78 F, which were its averages when degrees were Fahrenheit. But these days it's cool. The rest of Sydney had a cool morning (13-15C) and cool to average day - up to 30 at Penrith. Another beautiful day coming up tomorrow then hot on Tuesday, with dry Westerlies reaching the coast. The air mass isn't that warm, 850 temps over Sydney of 19 at 11:00 although getting up to 23 at 5:00PM. I think 37 across the Basin is about right. This morning is so nice and crisp with a temperature of a low of 12.4 degrees to start the day. This clutch towards a negative SAM must be the culprit for a switch a more westerly pattern. Quite possibly the best back end of a storm Ive ever seen. 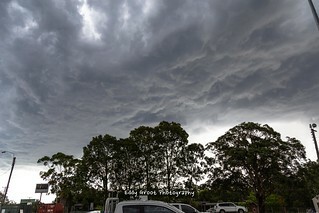 This was that black cored storm that tracked from Gloucester all the way down to Seal Rocks and every time I had a look on radar there was always some black in it. Edit my photo does no justice to it!! 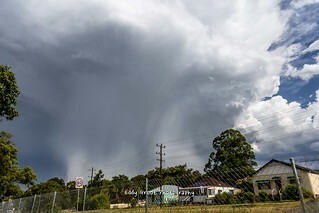 Myself and Mr Keene from Nowra chased that cell. Earlier on another storm we got a surprise at Clarence town with tree branches beginning to fly, and one that was large enough to do car damage must have fell just seconds after we passed - we were on a small road and turned around to find this branch blocking the road. We hooked onto the cell you photographed at Forster. It looked severe. It kind of split a little with the southern split powering. 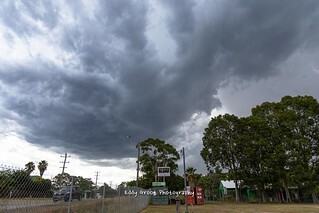 We encountered white out rain at dusk south of Forster, and when it cleared took some pics of it moving to sea. Thanks Oz, was wondering what it would be like underneath it whilst taking some shots, now I know. I did see yours and M Keene pics on FB and stunning pics too. About 9pm that night the lightning offshore was nearly continuous, no lightning pics from me as I had enough beer by then. Damaging winds forecast tomorrow for the STs. Chart looks more like July than Feb. Even so, 27°C forecast here tomorrow. If it really does get to 27°C, more likely to be 40°C in Sydney under a westerly stream. Lack of good rain continues in this district. Near the town and around Bathurst they've had much more. Such is the hit and miss nature of storms. Further ahead GFS suggests a dry pattern persisting until month end. Hope it's wrong. 38 for the big P tomorrow. Hopefully its a cool 38, low humidity! Though indeed the nights are getting crispier. Definitely had a taste of autumn in the last few nights. Looks like a bit more heat next monday, but no massive heat waves coming thank god. 9deg at 7am became 22deg at 830 - that wind has started all right! 124 km/h gust at Thredbo TS AT 9.28 am. Quite windy over the Central West and Riverina at the moment, also Central Tablelands, Southern Tablelands and Snowy Mountains districts. The winds are a comin'. Yep the same SWW has us here under DAMAGING WINDS, averaging 80 to 100 km/h with peak gusts in excess of 120 km/h are expected until the evening. Just had o close the doors and windows it's going mental. 8 registered (Steve O, sebbie78, Adaminaby Angler, wet sky, bbowen, Knot, scott12, 1 invisible), 59 Guests and 3 Spiders online.